PIBO’s fall migration season at Fish Point wrapped up on November 15th after 107 consecutive days of monitoring from August 1st. Bird activity during the final weeks of coverage was fairly typical for early November, although mild weather appeared to hold some species back, with only a few records this month for migrants like tundra swan, common merganser, common goldeneye, and snow bunting, among others. Unseasonably warm dawn temperatures from the 1st – 16th ranged from 6° – 16°C and no significant cold fronts were encountered. Diurnal migration during the first few days of the month saw the continuation of late October’s flights, especially blackbirds, with more than 25,000 tallied heading south off the tip from November 2nd to 5th – along with large numbers of American pipits, horned larks, and cedar waxwings. An active day on the 2nd produced 52 species including 89 horned grebes, 1225 red-breasted mergansers, 96 American crows, a station-high 185 horned larks, and 9691 blackbirds. 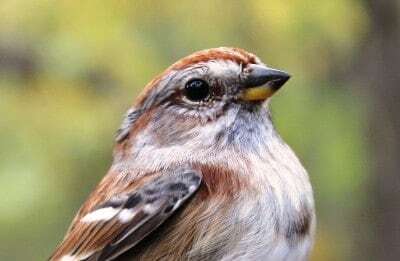 Eight sparrow species were detected during the 90-minute census on the 4th – a season-high – including 155 dark-eyed juncos and a fox and savannah sparrow. Bluebirds and robins were active as well, with 24 and 35 noted respectively. Ones-and-twos of brown creeper, golden-crowned kinglet, hermit thrush, and American tree sparrow were captured during the final two days of banding on the 4th and 5th. Forty-seven species were recorded on November 5th including 100 juncos, 67 goldfinches, 42 waxwings, and 27 pipits, along with thousands of blackbirds and an eastern meadowlark – a first for the fall. Stormy weather with strong winds from the southwest and steady driving rain the next morning made for a low-key census, with just eighteen species noted, followed by a somewhat more active morning on the 7th when 31 species were tallied including common loon, wood duck, northern harrier, sanderling, four sparrow species, among others, and a single northern saw-whet owl captured that evening. Some brief northwest winds that night encouraged another pulse the next day, with 1700 blackbirds noted on the 9th, along with a few lingering killdeers, phoebes, winter wrens, and hermit thrushes. Two American coots and ones-and-twos of four raptor species were observed on the 10th and 11th, after which a powerful southwest gale developed and extended over the next two days. Wind gusts at South Bass Island, just southwest of Pelee, reached 51 knots (94 kph) on November 12th. With the exception of 300 unidentified scaup, a similar number of red-breasted mergansers, four gull species, and a handful of songbirds, it was a very quiet and rainy census. The rain let up and the wind abated to 35 knots (65 kph) on the 13th, but it wasn’t much of an improvement, with just sixteen species recorded. Of interest, however, was the appearance of at least three Franklin’s Gulls at the tip. This uncommon gull shows up periodically in Ontario, but not regularly, and not in the numbers reported in the aftermath of the strong southwesterly winds this week. Online birding sites have documented record-setting numbers in the region, with as many as 55 individuals observed in one field. The final two days of the 2015 coverage season saw a return to some cool but calm conditions, though, at 6°C, still far from sub-zero. Scaup numbers increased to 700 on November 14th along with a nice variety of eleven other waterbird species including loons, horned grebes, a lingering cormorant, mallards, wood ducks, buffleheads, goldeneyes, mergansers, and a mixed flock of 3 black scoters, 3 surf scoters, and 6 unidentified scoters. A cloudless November morning on the 15th made for an enjoyable walk down to the tip and back – bluebirds, kinglets, robins, and goldfinches were about in good numbers – and brought the 2015 migration-monitoring season to a close. Eight fall ‘firsts’ were recorded from November 1st – 15th, which brings the fall species total of birds recorded at Fish Point during PIBO’s standardized six-hour count period to 162 (including 26 warbler species). The fall banding program concluded on November 5th with 2070 birds captured of sixty-six species (23 warbler species) in 2745 net-hours, along with a mere fifteen same-season recaptures i.e. of the 2070 birds banded this fall, just fifteen were captured again after their initial banding. Also – given the tens-of-thousands of blackbirds overhead – it’s remarkable that not one red-wing, cowbird, or starling, and only six grackles, were captured at the station this fall (from mid-August to November)! The average catch-rate from August 15th to November 5th was 0.75 birds/net-hour. Thanks very much to everyone who contributed to another successful year of research, education, and outreach on Pelee Island! Have a safe and happy winter. PIBO’s next migration summary will be posted April 15th, 2016.